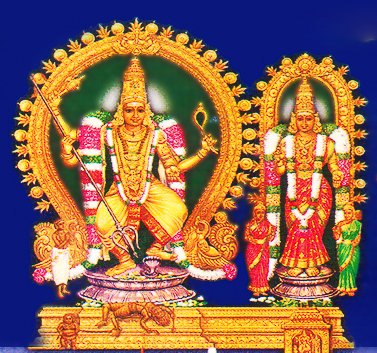 Amritaghateswarar Abhirami Temple is located in Thirukkadaiyur, 21 km from Mayiladuthurai, Tamil Nadu. This is one of the 275 Paadal Petra Sthalams.Saivite Saints Thirunavukkarasar, Gnana Sambandar and Sundarar have sung the glory of Lord of the temple in the celebrated Thevaram. People from many places in India come here to perform their birthdays or Shanthis like Sashtiapthapoorthy (completion of 60 years of age),Bheema Ratha shanthi(beginnig of 70th year),Sathabishekam (completion of 80 years and 8 months). Saint Abhirami Pattar is believed to have rendered the Abhirami Anthadhi in the front hall of the shrine. According to the legends,after the 'paarkadal' (churning of ocean to obtain the elixir ,Amirtham) they ignored Lord Ganesha and forgot to worship him, as it is the usual practice. Ganesha, hurt and offended by this act by the devas, stole the pot of Amritam and said to have hid it at Tirukkadaiyur in the shape of Shiva Lingam. Hence it is believed that just praying to this Shiva Lingam in this temple has the power to grant longevity to the devotees. The Shiva Lingam at this temple is known as Amrita Ghat Eshwarar. Ganesha here is called 'kalla' (thief, as he had stolen the amrit) pillayar. The Temple: The temple occupies a very vast area of 11 acres , with five praharams, several big gopurams.It has several spacious open halls and this is where the birthdays like sashtiapthapoorthy are performed, as it is considered auspicious to celeberate in the temple. Advance booking for this services is required though. There are three temple tanks, known as 'Amrita Pushkarini', 'Kaala Theertham' and 'Maarkandeya Theertham'. There is a separate sannidhi with a gopuram dedicated to Abhirami.The temple also has a separate sannidhi for Markandeya worshipping Kalasamhara Murty.It also has a temple for Narayana known here as Amrita Narayana and his consort Amrita Valli . Origin of Abhirami Anthadhi A few centuries ago, there lived a staunch devotee of the goddess Abhirami called Subramanian. King Saraboji visited the temple one day and Subramanian was meditating on the glories of Abhirami and ignored the presence of the king. Infuriated king inquired about this man was that refused to recognize him. One priest told the king that Subramanian was a lunatic, worshiping all women as the Divine Mother. Another priest of the temple said that Subramanian was truly a saint and a great devotee of Mother Abhirami. The king decided to test Subramanian and he asked Subramanian the thithi (day) of that day.Subramanian who was engrossed in meditation on Abhirami, seeing the moon like face of Abhirami, said to the king saying that it was a full moon day while in reality it was actually a new moon day. The king convinced that Subramanian must be mad, ordered that he be burnt in a wooden pyre at dusk if the moon failed to appear. Subramanian, now conscious of the reality of the happenings and With the flames rising all around him in the pyre, pleaded to the Divine Mother to save him from the situation. He began singing a song on Abhirami (one-hundred praises called Abhirami Anthadhi).While on the seventy-ninth verse of his song, Goddess Abhirami appeared before Subramanian and threw her ear stud into the sky. The stud took the form of the full moon. The king and his executioners and the people who had gathered to witness the execution were awestruck. The king prostrated before Subramanian to forgive him and and the king became his disciple. 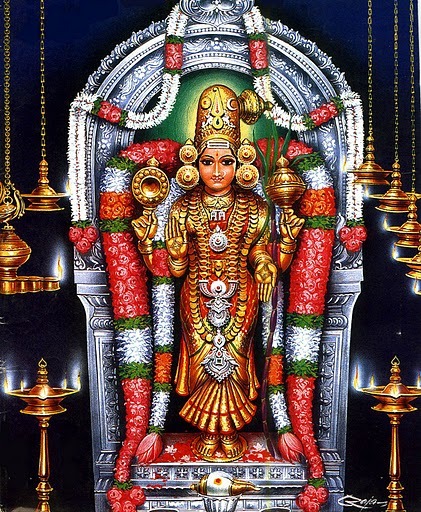 From that day onward, Subramanian was called Abhirami Pattar("priest of Abhirami").Even today, Abhirami Pattar is still celebrated at Thirukadaiyur on the new moon day in the Tamil month of Thai (mid-January to mid-February). Legend of Markandeya As per legend there lived a sage named Mrikandu with his wife Marudmati. They were both devotees of Lord Shiva and worshiped him for many years, praying for an offspring. After many years of penance, Shiva appeared to Mrikandu and Marudmati. later they were blessed with Markandeya, an intelligent son, but destined to live only upto at the age of sixteen. As Markandeya grew, he bcame very devoted to Lord Shiva and worshipped the Shiva Lingam at Tirukkadaiyur. On the day he was destined to die, king Yama appeared with his noose to take Markandeya along with him. Markandeya sought refuge in the Lord and embraced the Siva Lingam tightly. When Yama pulled Markandeyan forcibly with the noose, Lord Shiva appeared and warned Yama not to touch Markandeya, as he was under his protection. Yama refused to listen and tightened the noose, binding Markandeya and the Lingam together. Infuriated by Yama's arrogance, Lord Shiva kicked him and held him under his foot, and killed Yama with his trisool. Markandeya was blessed by Lord Shiva to remain sixteen years old eternally. It is for this reason that Lord Shiva is also called "Kala samhara" ( "Destroyer of Time/ Kalan or Yaman") at this temple. With no Yama , there were no deaths on earth, but people were still being born. Burdened by the weight of so many people and unable to sustain the growing population, Bhooma Devi (earth goddess),appealed to Lord Shiva for help. Lord Shiva, feeling compassionate for the earth, resurrected Yama.It is said that even today , we can see a small scar on the Shiva Lingam here where Yama's noose fell. Faiths & Beleifs: Based on the legend of Markandeya, it is believed that worshipping at this temple will give longivity to the couple celeberating Sashtiaptha poorthi ( completion of sixty years) and Sadhabishegam (beyond eighty) here. This temple is almost always crowded with such couple performing the 'aptha poorthis'. The lodges and priests are always busy because of this. Festivals The pooja rituals are performed six times a day; Ushathkalam at 5:30 a.m., Kalasanthi at 8:00 a.m., Uchikalam at 10:00 a.m., Sayarakshai at 6:00 p.m., Irandamkalam at 8:00 p.m. and Ardha Jamam at 9:00 p.m.There are weekly rituals such as somavaram and sukravaram, fortnightly rituals of pradosham pooja and monthly festivals like kiruthigai, pournami (full moon day) and sathurthi. 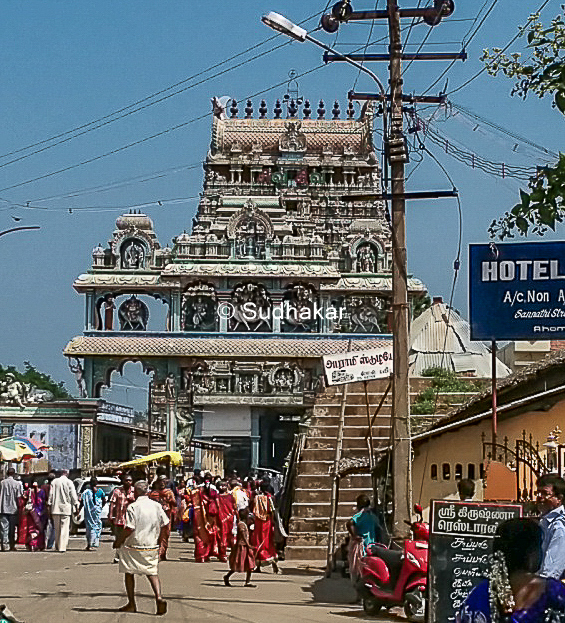 Temple location The temple is in the heart of Thirukadaiyur town and is easily reachable. Temple Timings The temple is open from 5.00 a.m. to 1:00 p.m. and from 4.00 p.m. to 9.00 p.m.
How to reach? This is well connected by road and plenty of buses ply from Chennai,Bangalore,Trichy,Tanjore,Chidambaram,Villupuram,Kumbakonam, Mayavaram. Where to Stay? There are many budget hotels and semi-deluxe hotels in this town.